DANVERS, Mass. – There was but one thing on St. Peter-Marian’s minds. The only item on St. Peter-Marian's agenda Saturday afternoon was attaining a victory. One, which might convince the Super 8 committee to bring them on board once the seedings are announced on Sunday. But, as usual, the task at hand was a fierce challenge. Facing St. John's Prep, a notable stalwart in the Super 8 sweepstakes, and a likely participant again this year, the Guardians knew the margin for error needed to be minuscule. 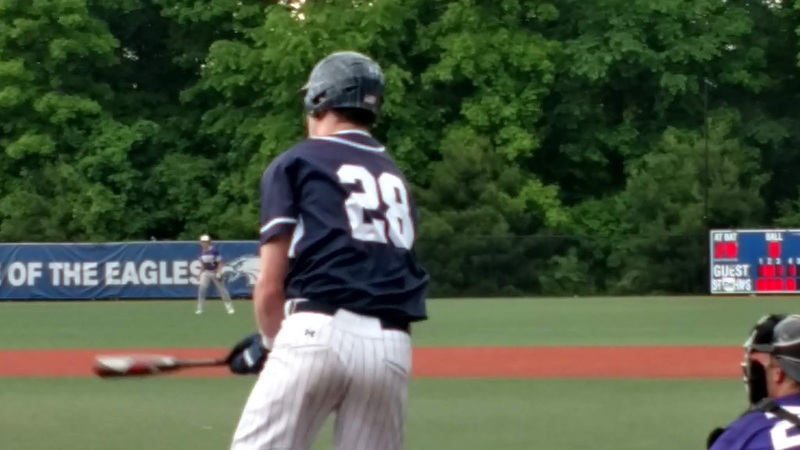 Staying close early, the Guardians (15-6) were unable to contain the Eagles in the latter stages as St. John’s Prep (16-5) erupted for four runs in their half of the fifth inning and en route to a 6-3 victory over St. Peter-Marian at Pete Frates Diamond. After an insecure week in which the Prep struggled despite picking up wins over St. Mary's of Lynn, Swampscott and Hamilton-Wenham, it fell victim in its previous outing to Billerica. The Eagles responded, however, versus the Guardians as they banged out eight hits and came through with some timely at-bats with runners on base. Eagles’ Senior Jake Sanderson performed brilliantly during his 4 1/3 innings on the mound as he limited SPM to no runs on just two hits, striking out seven and issuing just one walk. Facing Guardians' freshman phenom Luke Delongchamp, who entered with a 4-0 record and 0.94 ERA, SJP managed to strike for a pair of runs after three innings. In the opening frame, the Eagles loaded the bases on a Tyler MacGregor single, an Alex Lane double and an intentional walk to Mike Yarin. Delongchamp then proceeded to walk Jacob Bolger to make it 1-0. Delongchamp (4 IP, 7 hits, 1 K, 1 walk) settled down thereafter as he got Jack Cairns to bounce into an inning-ending double play. After stranding a pair of runners in the next frame, SJP added to its lead in the third. Lane, who finished 3-for-4 at the plate, smacked his second double to lead things off. Yarin followed with a ground double over the first base bag, sending Lane to the plate for the Eagles' second run. Sanderson, meanwhile, was having little difficulty with the Guardians' lineup. In the fifth, the Prep received some insurance. Lane opened with a line single to left, marking an end to Delongchamp's afternoon. Sophomore Frank Hernandez was brought in and immediately served up a wild pitch moving Lane into scoring position. A walk to Yarin was followed by Bolger's bunt single to juice the bases. Cairns next grounded a ball to shortstop tha led to an errant throw, bringing home both Lane and Yarin to put the Eagles ahead, 4-0. A Rich Williams' ground out platef Bolger before Andrew Dembowski laid down a squeeze bunt that brought Cairns across for SJP's sixth tally. With its offense dead silent against Sanderson, things started to change in the bottom of frame. Delongchamp opened with a walk but Sanderson got Matt Dumphy to fly out. Adhering to a pitch count, Letarte opted to pull Sanderson in favor of Kevin Dewing. After fanning Cody Smith, Dewing, a left-hander, offered up a single to Dan Malm to keep the inning going. Hernandez then worked a 3-2 count before blasting a hanging curve deep into right field for a two-run triple. A few moments later, Hernandez sprinted home on a wild pitch to suddenly pull the Guardians within 6-3. In the sixth and seventh innings, respectively, Sean Letarte and Garrett Siegel came on in relief to shut the door on SPM's comeback hopes, as they combined to allow no hits. Now the focus turns to what the committee thinks about the Guardians' chances of either earning a Super 8 bid or be sent to the Division 1 Central Mass. tournament.